You know what he meant: the 17th century. Or possibly the 16th century. I’ve written before about the trouble students have keeping the ordinals straight when referring to (notice how I resisted writing “referencing”?) centuries, and perhaps this student was trying to avoid making a mistake by making the actual date ordinal. But I like to think rather that he’s imagining how much fun the future will be. It may be driven by technology, and robots (like corporations?) may by then be “people, my friend,” and because of climate change (if of course it’s real) the landscape may be unrecognizable—but fear not, it WILL have a lusty side. We haven’t read any literature that predicts the future, but I’ll imagine my student had that in mind anyway. Always best to err on the hopeful side. Today’s forecast for Connecticut is daunting: blizzard, white-out, closed roads, snow piling and drifting deep, probable widespread loss of power, cold temperatures… I looked for Horrors that had to do with any of that, just so my blog post could be topical, but I found none. Hence this post about “this piece.” At least the lusty 1600th century takes us into hyperbolic territory. And in case you’re shut in by weather but still have power, I invite you to enjoy “Snowbound,” by John Greenleaf Whittier. My fifth-grade class had to memorize chunks of it, and any snowfall continues to evoke its images, its rhythms, its world, its human warmth. It was published in 1866 and is a reminiscence from the author’s youth: it is a 19th-century poem. A lovely, lovely one. If you enjoy these, please leave a comment and your own favorite snow poem! 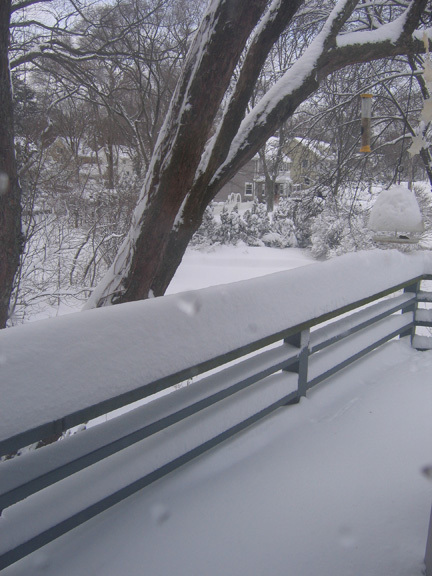 After a snowstorm a few years ago: view from my deck. NOTHING compared to what is forecast this time! Dear lord, where to begin? Most chilling is the last line: the white boy will love the black boy once the black boy is like him. White is still the default. And this happy reconciliation, this happy quasi-equality, is only what the little boy imagines; it was not in his mother’s promise, and it is perhaps not in God’s promise either. The “little English boy” is the one with the agency when it comes to loving. We know Blake, though. We know the songs of children, in his hands, are often laden with irony, with condemnation of society, with the injustices inflicted by social, economic, and religious institutions on human lives and souls. Read the “chimney sweep” poems if you have any doubt. 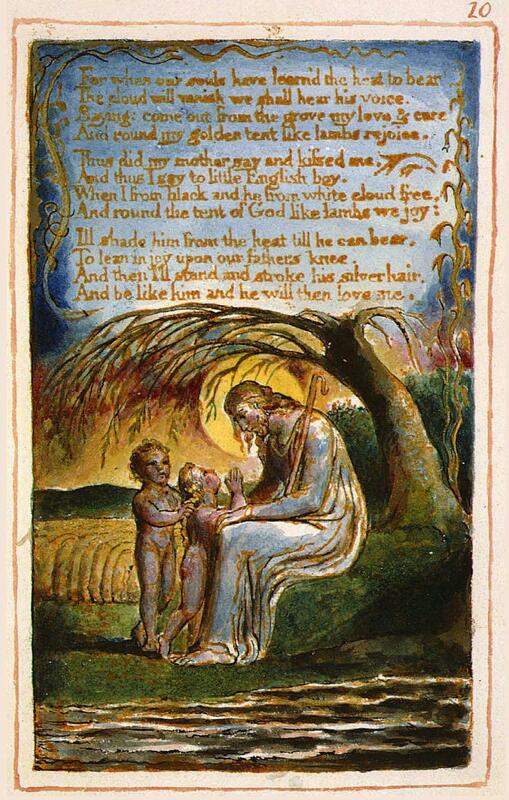 Blake himself is not offering this “comfort” to the little black boy; he is writing of the boy’s heart, hopes, and helplessness, and the mother’s comforting words and images are all she can offer to alleviate the injustices of his life. Blake does not approve of the world as it is. Dare I hope these complex ideas in the poem, uttered in such deceptively simple lines, are what “caught” my student’s attention? Alas, all goes out the window with the change of “boy” to “guy.” Talk about trivializing language, talk about dismissive language, talk about the off-handedness that seems to dismiss the poem, or the character, in the very act of singling it out for praise. I can theorize that my student didn’t want to use the word “boy” in conjunction with “black,” perhaps having learned how demeaningly that word was applied to adult males, how offensive its use is still because of that. I have spoken with a few students over the years who said they didn’t know how to refer to a black male under the age of ten, since they knew they should never say “boy.” Were the same reluctance and confusion operating here? Yes, I tell myself, not really knowing. I like my theory better. Language is such a potent thing. We are right to be observant in its use. We’re referring here once again to the ever-interesting (and, for student writers, ever-risky) Sir Gawain and the Green Knight. My student is correct that keeping promises is important in the poem. It is a mark of honor not only for the individual knight but also for the reputation of the Table Round altogether. Morgan-le-Fay has set out to destroy the credibility of Camelot, and the ploy she uses is the famous beheading game between Sir Gawain and the Green Knight. Gawain takes the dare to strike G.K.’s head from off his shoulders with an axe, agreeing to search out the Knight a year later and receive a comparable blow. Severed, the head reminds Gawain of his promise; the reader then watches the months go by as Gawain anticipates fulfilling the agreement with growing dread. But he sets off in good time to keep the appointment. After a difficult journey he happens on a delightful castle where he rests, exchanges promises in an evidently less deadly game with the castle’s lord, flirts with the lady, hears Christmas Mass, and duplicitously secretly accepts a sash that supposedly will protect him from the Green Knight’s axe. On his way once again, he is offered an “out” by his guide: run away and the guide won’t tell. But Gawain keeps his promise; and the Green Knight, impressed with Gawain’s essential honesty and pluck, lets him off with the merest nick. Gawain returns to Camelot ashamed that his honor was proven flawed; but the lords and ladies are so proud of him that they all don green sashes like the one he considers his badge of shame. And Morgan-le-Fay loses, this time. Now, I believe she meant more than that. Keeping your promises proves that you are a man of honor, perhaps. The behavior of keeping promises attests to the knight’s integrity of character. Something like that. And if that’s what she meant, she was right. She was right, too, that the first clause is insufficient to make that full point. But the second clause is insufficient to make it, too, because it’s virtually identical with the first. It adds nothing, amplifies nothing, explains nothing, contextualizes nothing, clarifies nothing. The cause-effect connection promised by “because” is never earned. All the second clause does is make the sentence feel as if it says something, feel finished, feel significant. Her instincts are fine. But her sentence promises more than it delivers. Kind of like Gawain, if you want to be cynical about it. This blog entry writes itself. In World Lit I we read, among many other works, Sunjata (also spelled “Sundiata,” as in the translation I used the last time I taught this work). It’s an extended poem, originally from the oral tradition and still intended for oral performance, from and about Mali and the great hero Sunjata; it tells of that part of Africa during the time when Islam was becoming established. My students like it very much. The episodes are amazing, the hero is delightful, and the presentation is spellbinding. Please feel free to write your own tribute to the value of a good vocabulary. I’m not sure whether my student is trying to convey genuine enthusiasm or imitating that hearty voice that used to be the voice-over for the opening of The Lone Ranger. Either way, she is doing her best to ramp up the passion of the sentence. Those racing hearts, those famous words, the sonorousness of the final word as the emotion drops to despair…. Actually Edgar Allen Poe sometimes does have my heart racing. All the exclamation marks and dashes as the narrator insists on his sanity to the accelerating heartbeat under the sentences in “The Tell-Tale Heart.” The blind groping in the perilous darkness as the scythe-blade swings closer and the walls push inexorably toward the fetid abyss in “The Pit and the Pendulum.” My startled realization that the “you” in “The Cask of Amontillado” is not a narrative convention, but an actual inclusion of me as a character, the aging murderer’s confessor, in the story. Certainly the speaker’s heart has its racing moments, too, in Poe’s poetic triumph of rhythm, sound, and sensibility, “The Raven.” I’m not sure the reader’s heart follows suit, though: the refrain “Nevermore” is a long hollow fall rather than a shrilly climbing scream. Nevertheless, a racing heart is what my student wants to point out. I hope her heart did race. And that must have been quite a race, too, to leave the heart all sweaty. Or perhaps the heart is always sweaty: the sentence is unclear as to that. Did I miss something back there in Anatomy class? The image is really almost too much. The reader of this sentence must, I think, take a moment to quell the rising laughter that accompanies the vision of a sweaty heart. And the quelling is only momentary. Why in the sweet world did she put that “s” on “word”? Yes, the worD is famous. Poe’s own essay “The Philosophy of Composition” traces the intellectual process by which he crafted this poem, and puts special emphasis on his reasons for choosing the worD “Nevermore.” I’m glad my student responded to it. But she herself typed the worD correctly: “Nevermore.” Had she mistaken the line and transcribed it as ending “Never more,” she would have been talking about more than one word. She makes no such error, though. Perhaps her sweaty heart dripped onto her typing fingers and caused them to slip onto the “s” unbeknownst to her. Language is conceptual and often pictorial. Many of my students are blind to the pictures. A heart completing its first 10K race, flushed with pride and heat, dripping with sweat, its little undershirt soaked…didn’t she see the picture she evoked in her sentence? Probably not. 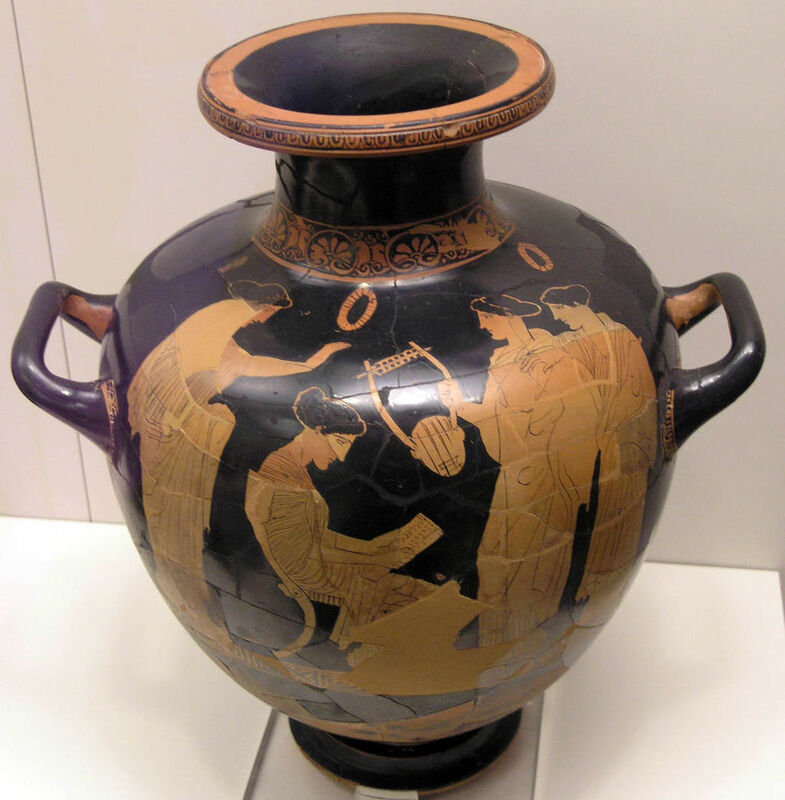 A student who actually capitalizes on the pictorial quality of language is a rare bird indeed nowadays, rarer than a talking raven sitting on a bust of Pallas. For instance, on quite a fundamental level: If you read a lot of writing by younger people, you will wonder where the phrase “based on” has disappeared to. My students say, and write, “based around” and “based off of.” I bring in a little statue and a block of wood, identify the wood as a “base” for the statue, and then put the statue next to the block. They know that’s wrong. Presumably they know that a runner who is “off of” the base in a game of baseball is vulnerable to being tagged out, and they have not seen many base-runners run rings around the bases rather than actually step on them either. Yet even after my little object lesson (yes, I tried it this year, in frustration), my students continued to “base” interpretations, conclusions, and plans “off of” or “around” observations and data. This supposedly visually-oriented generation has no mind’s eye. And I’m afraid they’re not going to develop one. Ah, well. After all, she seems to have liked the poem. It seems to have stirred enthusiasm in her. So I have to say this: Bless her sweaty heart.